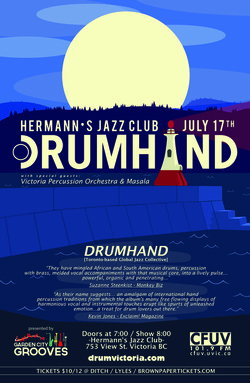 With layered drumming and poly-meter at the core, many of DRUMHAND’s accessible and edgy compositions feature the one-stringed ‘stomach harp’ of Brazil or the box-shaped Gomé foot drum of West Africa alongside the woodwind magic of Marcus Ali (Cruzao/Jason Wilson) and brass love of Rebecca Hennessy (Woodshed Orchestra). The group’s ‘folkloric’-style vocals appear in a variety of languages and sometimes offer audiences a part in the show. 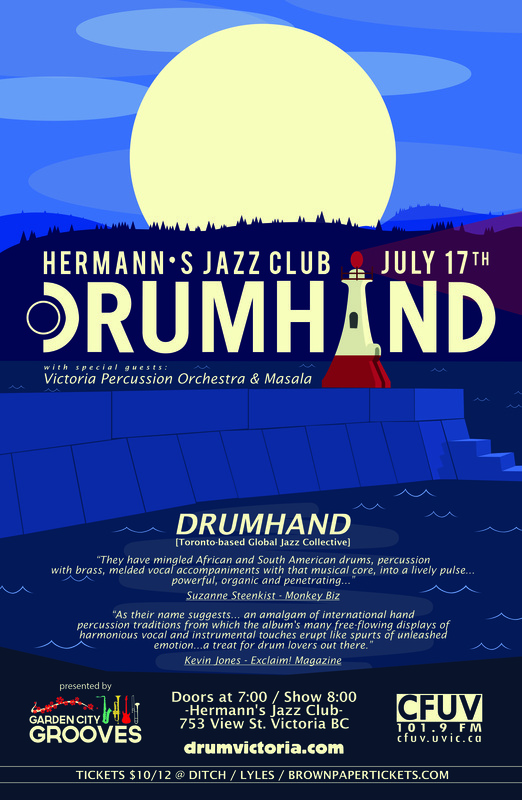 Three albums and several tour miles later, DRUMHAND is becoming increasingly known for innovative orchestrations; dynamic and uplifting performance energy; and artistic accessibility for audiences of all ages. Their unique inclusiveness can be experienced in concert at festivals; school performances; music venues; street parties and nightclubs across Canada and the US. Local percussion supergroup the Victoria Percussion Ensemble, and Victoria's samba kings and queens, Masala, kick off the evening of what is surely to be one of the summer's most memorable shows in the Capital.